Who doesn't love shopping? We all do (men included :P). With many online shopping portals opening up, we all find beauty products online shopping easy rather than dropping in to a store and shop. 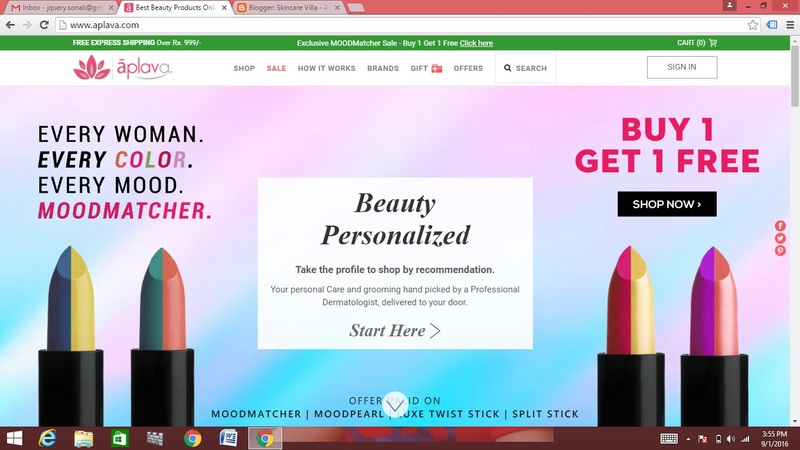 Even now-a-days I feel online shopping is much better as we get discounts too :D. Today we will be talking about my Aplava.com shopping haul and my shopping experience with them. Aplava has a range of high end brands which range from skincare to makeup, from bath and body to fragrances, from Wellness to intimacy. While going through the brands I also got to know that Aplava in itself is a brand and has makeup brushes also. 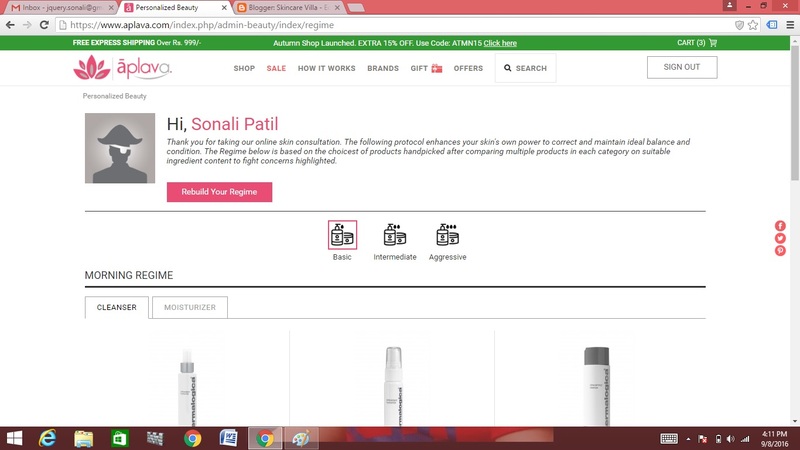 So on Aplava.com you can buy makeup brushes online too :D. One thing which intrigued me was their Personalized Beauty section wherein we fill up our beauty profile and get beauty regimen recommendations. 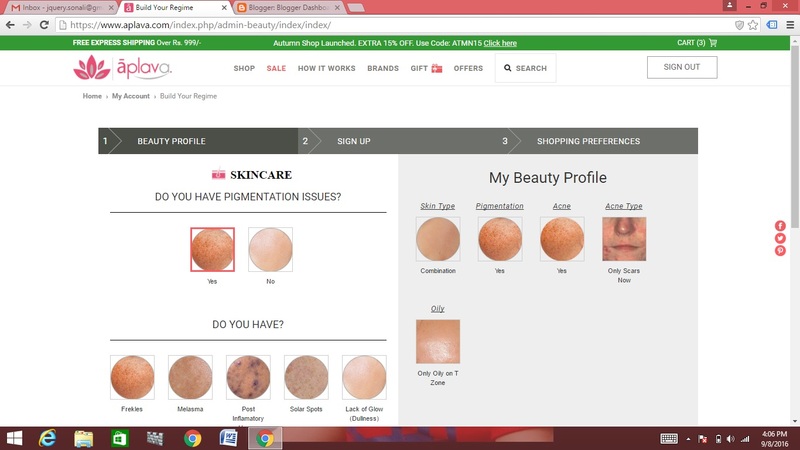 Below is the screenshot of the beauty profile page. They also have Aplava Prestige Rewards wherein you earn Loyalty points which can be redeemed on your next shopping. Also they provide Free Express Shipping on orders above 999/- and you receive complimentary samples with every order. Although I didn't receive any complimentary samples with my order :(. Now coming to my shopping experience, it was a hassle free one. I placed my order on 29th August 2016 and received my order on 7th September 2016. Initially I had ordered Natural Bath Grapefruit & Vitamin C Gel Face Masque and other products (will reveal soon :D). On 2nd September 2016, I received an email from the website stating there was a hitch in my order as Natural Bath Grapefruit & Vitamin C Gel Face Masque was not in stock even with Natural Bath and Body brand. The customer care also asked me how to proceed with the order and suggested me to give an alternative to serve and needed my confirmation. I immediately emailed them to send any other product of same brand, same cost value. I received an email back stating that they had noted my requirement and immediately informed me that they would be sending me Natural Bath Vitamin E Whipped cream and my order would be proceeded soon. All the email conversation with the Customer Care took place in a single day and all I can say is that their Customer Care service is excellent. But I was heartbroken since I didn't get the product of my choice. One thing which bothered me here is why aren't products Out of Stock marked duly?!!! Even after this glitch the product still isn't showing Out of Stock status :(. Since I received a voucher for my shopping I didn't mind this problem and happily agreed to send another product of same brand and cost. I received my order in a nice Aplava box with each product individually bubble wrapped. The box and all products weren't damaged or broken at all. Overall I had a good time shopping with Aplava.com and they have excellent Customer Care service. The website is also pretty fast and has a clean and nice theme which is very easy to navigate as well. I was pretty content with my shopping experience and wish to shop again with them. Have you shopped from them? How was your experience?